The machine has a dual-vision system with a dual head, and the control software runs on the NXP LPC1769. The auto-feeders are running with a NXP Kinetis K20DX128 on each feeder and a NXP Kinetis K22FN512 (tinyK22) is the feeder master between the LPC1769 and the bank of feeders. 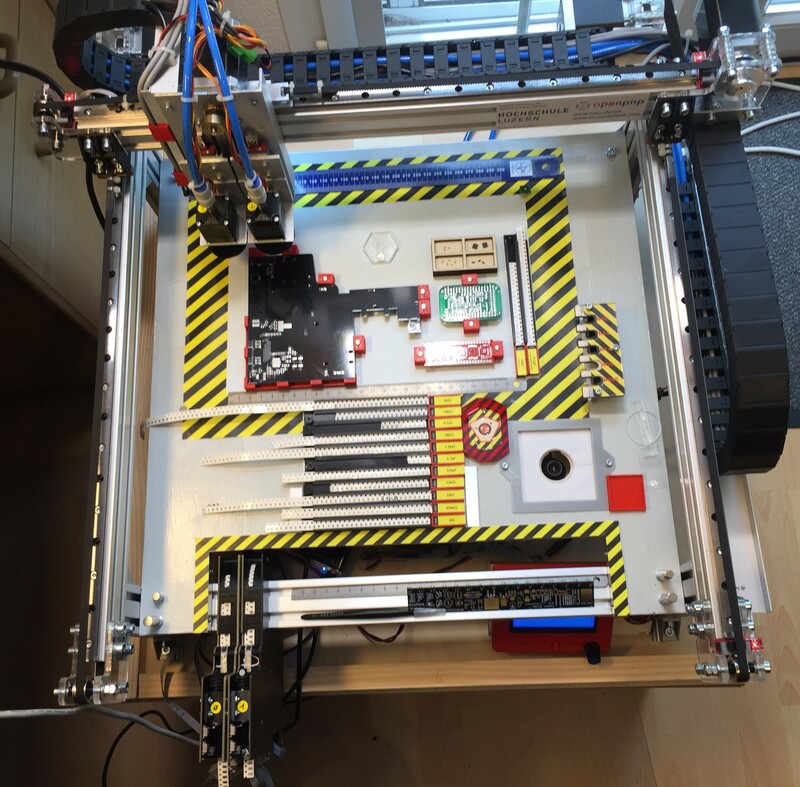 This entry was posted in 3D Printing, ARM, Boards, Building, CPU's, Embedded, Kinetis, LPC, LPC, OpenPnP, Robots, TinyK20, tinyK22 and tagged Building, ECC, Embedded, Embedded Computing Conference, NXP, OpenPnP, Pick&Place, SMT, technology by Erich Styger. Bookmark the permalink. Nice work! I got my assistant started on setting up OpenPNP on our TVM802A and it sounds like he’s making some progress. He says the software is a lot easier to use than what the machine came with. It’s the only piece of equipment in my shop that I didn’t set up personally and that I’ve never really used so the machine is a bit of a mystery to me. I did weld a pretty nice steel stand for it, though. Thanks! I really like the OpenPnP software: it is easy to use and easy to extend with additional Java snippets. And most configuration can be done using XML configuration files. It took me a while to have it configured, but now it is really working well. How long rang aluminium profile? And acrylic dimension? The 2040 profiles are 50 cm long. The PMMA is 5 mm.